Theodore de Bry (1528-1598) was born in Liége, and worked as a cartographer in Frankfort am Main. The stamp from Jersey reproduces part of a map engraved by Theodore de Bry, which, in turn, may have been based on a map, now lost, by John White. White accompanied the first of Walter Raleigh’s colonizing expeditions, and was the governor of Raleigh's colony on Roanoke Island. The map was printed in A Brief and True Report of the New Found Land of Virginia, by Thomas Hariot, published in 1588. Hariot wrote, “Because of the many islands on the seacoast of Virginia it was difficult to discover an entry to the mainland....Before we came upon an entrance we made many attempts at different places.... Sailing farther, we reached a large island. “As soon as the inhabitants of this island caught sight of us, they set up a loud and terrible outcry, as if they had never before seen men dressed as we were, and they ran off screaming like beasts and yelling like madmen. But we called them back and offered them presents....Convinced of our good intentions and kindness, they slowly approached and made us welcome.... Thus we reached the part of the world called Virginia.” However, the part of the world they had really reached was North Carolina. 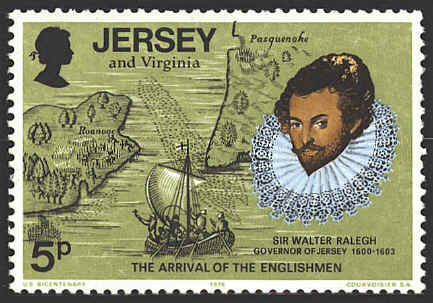 A close examination of the stamp shows a shipload of colonists headed toward the island, the figures of the inhabitants running away from them, a fish-weir off the coast of the island, shoal-waters, indicated by patches of dots, and the Indian villages of Roanoac and Pasquenoke.